US: Cranes, service trucks and technicians climbing towers are the obvious image when thinking of wind turbine operations and maintenance (O&M). But behind the scenes, one of the critical players in wind farm O&M is the increasingly sophisticated remote monitoring that plant owners and manufacturers employ. Remote monitoring - no need to go inside the turbine? On any given day, 24 hours a day, GE Energy's technicians are monitoring over 6,000 wind turbines globally from state-of-the-art remote operations centres in Schenectady in New York state, and Salzbergen, Germany. Each service centre uses automated software for remote resetting and troubleshooting, providing weather information to sites, and maximising turbine production by providing technical assistance to its customers. In addition, data collected through the system provides information to diagnose incipient or systematic issues, giving a large team of engineers the insight they need to make recommendations that can reduce turbine downtime. With over 13,500 turbines in operation, GE bases its procedures to resolve turbine faults on the company's own extensive product knowledge, service engineering expertise and years of fleet operation. It begins with a supervisory control and data acquisition (Scada) system, which is the turbine owner's primary window into the operation of their assets. The on-site Scada system is connected to each turbine generator's control system and links results back to the remote operations centre where the operating parameters are tracked and relayed to specialists. The Scada system uses automated algorithms to detect abnormal conditions and, if one occurs, a GE specialist trained on that particular fault is automatically notified and can address the problem remotely. The fleet is measured on turbine availability and fault occurrence so that when trends emerge on a particular fault or anomaly, more detailed analysis can identify solutions. Data collected can also identify opportunities to improve performance by upgrading turbines - an inexpensive way to increase revenue in the long term. If a drop in production is noted through monitoring and diagnostics, a list of potential causes is created. These can range from environmental issues, such as bad weather, to equipment problems such as a parts defect. 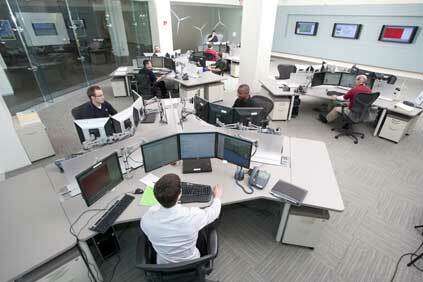 The remote operations service specialists are able to manage the wind plants based on this information. This can include shutting a turbine down, recommending a follow-up service or an appropriate upgrade. Resolving and resetting a fault remotely can save the time and expense of having a field technician visit the turbine - particularly with so many wind farms operating in remote locations. With constant tests running on a fleet of turbines, early indications of a fault that is developing or poor performance in one turbine can be identified by simple outlier detection analysis, revealing a potential anomaly across the entire fleet. By increasing the chance of predicting a turbine event, owners can avoid unplanned maintenance and integrate preventive action into a routine maintenance schedule. Condition based maintenance (CBM) is another feature that allows operators to understand issues before they become a larger problem. It uses technologies such as vibration analysis accelerometers on the main bearing, gearbox and generator to search for impending drive train issues, relaying that analysis back to the office or control room. In this way, the entire fleet is remotely managed from a centralised location, providing information that offers a bigger picture than can be seen by an on-site technician. As well as vibration sensors, GE uses a system that can automatically monitor gearbox oil for metal particulates, a sign of wear, and report back to an operations centre. GE's remote monitoring arrangements are not all the same - they are tailored for unique customer needs. But through its use, GE is finding that this emerging trend can be critical to maintaining the performance of a wind turbine and proactively identifying needed repairs and enhancements.